Scottish prog rockers Atlas: Empire have streamed the whole of debut album The Stratosphere Beneath Our Feet with Prog. You can listen to it below. "The Stratosphere Beneath Our Feet is a concept album that explores what would happen to humanity if we became entirely reliant on technology/automation in every aspect of our lives – and more importantly, what happens when that system fails?," the band tell Prog. "Across it's 10 tracks, we delve into different aspects of that very-possible future, with each song takes place before, during or after a mass technological collapse, from the perspective of a different “character." 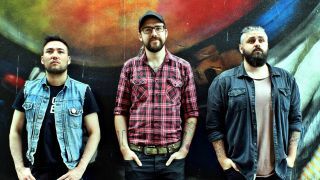 Atlas: Empire formed in 2011 and have released three EPs up until now and have toured with the likes of The Pineapple Thief, Good Tiger and Closure in Moscow. The Stratosphere Beneath Our Feet is released tomorrow. It can be ordered from the band's Bandcamp page. For further info go here.